2019 Mar 17 - FoWSS Committee, Soutar House, 7:30pm. 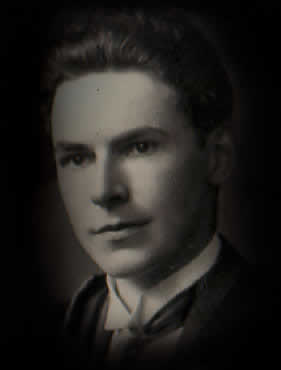 2019 Apr 26 - Soutar Birthday Lecture, Soutar Theatre, A K Bell Library, 7:30pm. 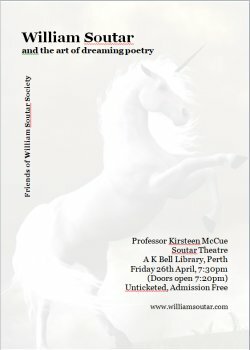 2019 Apr 26-28 - Soutar Festival, A K Bell Library and several Perth venues. 2019 Aug 25 - Soutar Tea, Soutar House, 3:00pm. 2018 Oct 29 - FoWSS AGM and Committee, Soutar House, 7:30pm. 2018 Mar 06 - FoWSS Committee, Soutar House, 7:30pm. 2018 Apr 27 - Soutar Birthday Lecture, Carl MacDougall, Soutar Theatre, A K Bell Library, 7:30pm. 2018 Apr 27 - Soutar Exhibition Reception (launch date from 6:30pm; permanent display thereafter), A K Bell Library. 2018 Sep 28 - Bairnrhymes Competition, Soutar House, 12:30pm. 2018 Oct 30 - FoWSS AGM and Committee, Soutar House, 7:30pm. 2017 Apr 27 - Soutar Birthday Lecture, "Oor Wullie - Small?? Mere Miniaturist or Major Poet?" by Dr Joy Hendry, Soutar Theatre, A K Bell Library. 2017 Apr 28 - Soutar Flagstone Unveiling, Makars' Court, Lawnmarket, Edinburgh. 2017 Aug 27 - Soutar Tea, Soutar House. 2017 Sep 16 - Soutar House Door Open Day. 2017 Sep 29 - Bairnrhymes Competition, Soutar House. 2017 Oct 24 - FoWSS AGM and Committee, Soutar House. 2016 Mar 18 - Tour and Bairnrhymes, Craigie Brownies, Soutar House. 2016 Apr 05 - FoWSS Committee, Soutar House. 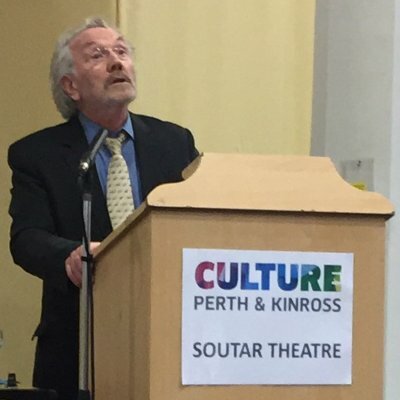 2016 Apr 28 - Soutar Birthday Lecture, "William Soutar, Translation and the Scottish Renaissance", talk by Stewart Sanderson, Soutar Theatre, A K Bell Library. 2016 Jun 02 - Soutar City Centre Walk, PKC Planning Department. 2016 Jun 02 - Soutar Talk, "As Canty As Ye Can", featuring Joy Hendry, Main Point Books, Edinburgh. 2016 Jun 07 - Soutar Writing Prize entry deadline. 2016 Aug 27 - Soutar Writing Prize winners announced. 2016 Aug 28 - Soutar Tea, Soutar House. 2016 Sep 06 - FoWSS AGM and Committee, Soutar House. 2016 Sep 07 - Soutar City Centre Walk, Trefoil Ladies. 2016 Sep 24 - Soutar House Door Open Day. 2016 Sep 30 - Bairnrhymes Competition, Soutar House. 2015 Apr 30 - Soutar Birthday Lecture, "William Soutar's Time: Reminiscences by Contemporaries", Katrina MacLeod, Soutar Theatre, A K Bell Library. 2015 May 19 - Soutar Talk, Rotary Club of Perth Kinnoull, Royal George Hotel. 2015 May 21 - Soutar Talk, St Leonard's Probus Club, Dewar's Rinks. 2015 Jun 23 - Soutar Writing Prize entry deadline. 2015 Aug 29 - Soutar Writing Prize winners announced on Writer's Day. 2015 Sep 20 - Soutar Tea, Soutar House. 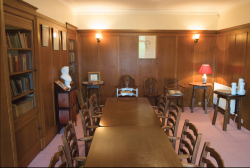 2015 Sep 26 - Soutar House open as part of Doors Open Day 2015. 2015 Oct 02 - Bairnrhymes Competition, Soutar House. 2015 Nov 16 - FoWSS AGM, Soutar House. 2015 Nov 26 - Soutar House Evening featuring Ian Grieve. 2014 Mar 25 - Soutar Talk, Perth Burns Club President's Night, Salutation Hotel. 2014 Apr 24 - Soutar Birthday, William Soutar and Hugh MacDiarmid, Dr Paul Barnaby, Soutar Theatre, A K Bell Library. 2014 Jun 04 - Soutar Talk, Tay Probus Club, Dewar's Rinks. 2014 Aug 03 - Soutar Tea, Soutar House. 2014 Aug 10 - Sma Room Seance, Soutar Theatre, A K Bell Library. 2014 Aug 12-16 - Sma Room Seance, Back Room, St Bride's Centre, Edinburgh, EH11 2DZ. 2014 Sep 16 - FoWSS AGM, Soutar House. 2014 Sep 20 - Doors Open Day, Soutar House. 2014 Oct 03 - Bairnrhymes Competition, Soutar House. 2014 Nov 24 - The Still Life Poet, Radio 4 broadcast with Liz Lochhead. 2014 Nov 29 - Books Don't Give Up All Their Secrets At Once, Soutar House.